You have no need of fears as to my position on the question about which you write. There is agreement on both sides. There is some very effective argument against it. But I shall take the position in favor of enfranchising women. Perhaps it will be left to a vote of the people. Or it may leave it open to the legislature. There is little doubt about the convention granting legal sanction. My husband came across this old letter years ago while looking through boxes of memorabilia at his parents’ home. The letter was written to his great-aunt who, so the family lore goes—although we’ve never been officially able to verify it—was one of the first female lawyers in Ohio, if not the first female lawyer. And it’s written on official stationery from the President’s Office of Antioch College, in Yellow Springs. S.D. Fess was Simeon Davidson Fess, Antioch College’s president from 1906-1917. A Republican, he later went on to represent Ohio for several terms in both the U.S. House of Representatives and U.S. Senate. How he and Anna—an avowed Democrat—knew each other is lost from the family lore. My guess is that they met in law school. In any case, it is certain that she was a Democrat and, for her day, a feminist. And, however they knew each other, it is clear from the tone of the letter that they had a respectful discourse about the issue of women’s right to vote—a hot button issue in 1912—and that he wanted to reassure her that he agreed with her view that women should be allowed to vote. Of course, in the eight years that would pass before women earned the right to vote, the issue wasn’t always discussed so politely. It’s well known that suffragists met with hostility and violence. It’s also true that not every woman desired, or thought women should have, the right to vote. There was also, to borrow-with-a-tweak Fess’s phrasing, “disagreement on both sides,” and for both genders. In THE WIDOWS, in 1925, women have had the right to vote for five years, but the notion is still met with varying opinions. Progress and change do not occur quickly or without an ebb and flow of opinion and contention. Lily and Marvena would have been younger than Anna, but (if fictional and real worlds could overlap), it’s possible they would have met. I believe they would have gotten along with like-minded spiritedness. To some degree, the letter carries—107 years after its writing—the weight of history and social justice issues. And yet, it’s also a simple artifact of family history, framed and hanging on the wall in our living room. 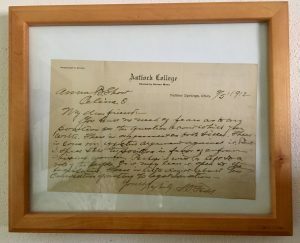 It’s a letter that we’ve taken from the wall and studied several times with our now-adult daughters over the years, including recently, as our younger daughter prepares to go to law school. I like to think Anna B. Short would be proud of her great-great-nieces: both registered, active voters (of course), and both finding their way in challenging careers that would have either been closed to women in her day, or made nearly impossible to navigate. 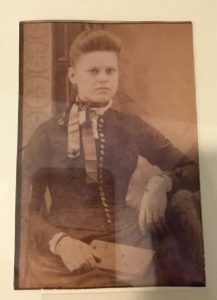 I imagine she would both shake her head in amazement at all that progress has made possible for her great-great-nieces, and all the progress that still needs to be made on many fronts.